A complete kit to convert CSI 3000 series (and compatible) bench power supplies to off-load CC (constant current) adjustable setting. The standard functionality of these Power Supplies is that the user cannot change the CC (constant current) setting without actually running at load, which makes it impossible to preset a control current. This easy to fit kit allows the user to use the existing front panel buttons (UP/DOWN) to change the CC setting at any time on the LCD, on or off load. Fully assembled & tested Pcb (from my own workshop). On-board LED provides functional status. Tested with my own CSI3003X5 & CSI3005XIII power supplies, but may possibly be used (subject to your testing) in other CSI and other similar branded power supplies. I have had a few reports from people that there are quite a few other branded PSU's out there that use the same internals as the CSI range, so if your PSU has the almost identical look and feel of the front panel as mine then chances are this kit will work. If in doubt check out my video where you will see the internals in detail. UPDATE: I've been more than surprised at the amount of brands that use the same internals, even the 0-120VDC versions I have confirmed work with my kit! The kit is fitted simply by snapping it onto plastic standoffs (existing holes within the PSU) and plugging it in. All thats then required is just the soldering of three wires to specific points on the existing control board inside the PSU. No drilling of any holes, no cutting of any wiring or Pcb traces etc is necessary. I've made this as easy as possible to install. See the video & photos below which provide all the necessary info for installation. The kit does not require any calibration (on the above power supplies anyway), but does include a potentiometer just incase a particular model needs it. The kit provides a current setting across the range of the power supply (max. is usually 3A or 5A depending on model). 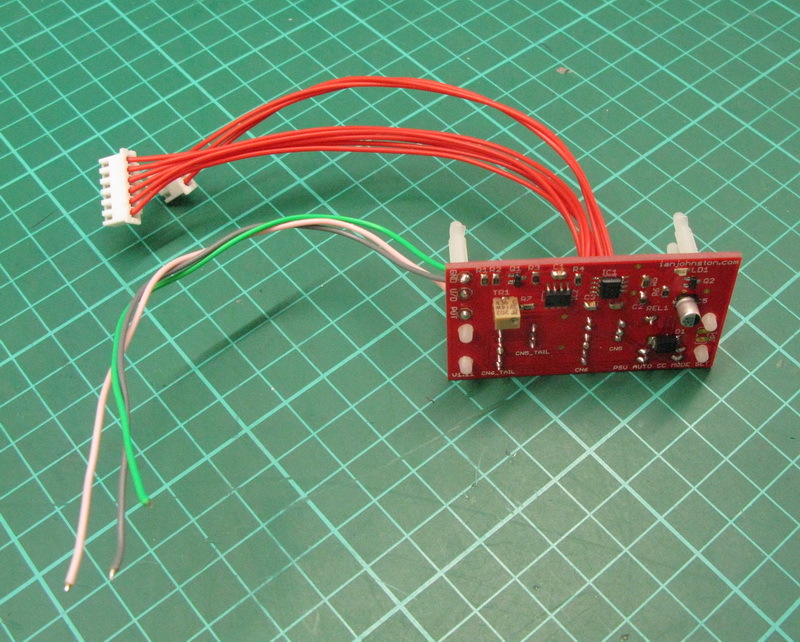 JP1 jumper - To manually set LCD to display CC Mode Set. This is for factory testing only. Each one tested with my own CSI3003X5. Please refer to the YouTube video here for full installation instructions. No written instructions are shipped with the kit, it's all in the video. Pcb's now being shipped are V1.2 and since version V1.11 contains a new op-amp is used for better low end CC setting performance and better accuracy. However, due to the CSI CC 'step' setting and performance of the CSI power supplies this kit may not be 100% accurate at the very bottom of the current scale, and also, the kit does add in extra wiring and semiconductors in series with the CSI control signals so 100% accuracy of the set CC current is not guaranteed. I have found it varies between different power supplies but is usually quite accurate. Electronics can be dangerous, so if you are not experienced or have any doubts at all then ask somebody who is to help you fit this kit. You can also email me via the contact form on this site in advance of your purchase if you have doubts. Again, electronics can be dangerous so please take care. I have designed this kit and tested with my own CSI3003X5 & CSI3005XIII power supplies, but I cannot be responsible for any changes CSI have made between models and any incompatibilities that may result. I also cannot guarantee that other CSI like power supplies will work.